A vacation home like the budget homes designed by the most famous American architect in the 1950's. This home needed to be organic, that is it must be designed to be in harmony with the site. My ideal project! Of course to design a home to be in harmony with the site requires a site visit. 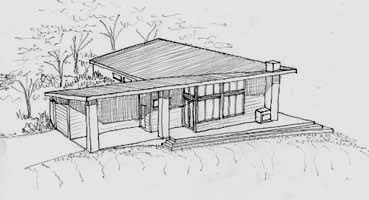 We looked at several spots to place the house, settling on one that sloped down to the south for easy passive solar heating. It also had good driveway access and a very nice view overlooking a "holler," the Appalachian term for small, wooded valley. There was even a pond below. I really wanted to get this right. Instead of copying the details and materials of that architect, I needed to design with his principles, to design it like he might have today if he was still alive. This requires thinking like him. I have read alot about him, including books he authored. I could see how he payed attention to the slope of the land, the direction of the light, and the needs of the client. But there was going to be one difference. I was going to pay attention to the clients' budget. This home was designed to be one with the site. The access is easy, flowing with the existing slope. The glass faces the best directions for light, view, and warm winter sunshine. It could be sliced right into the hill without tearing up all the trees and ground. To add some interesting drama, I designed the roof fascias over the patio to extend further and further out as they reached a sharp point near the chimney. The steps of the patio would follow the same sharp angle, making this patio corner the focal point of the home. An outside focal point would draw attention to the beautiful outdoors, a principle followed by the architect they loved. It would also make the home more comfortable. Because the point faces south, the tall glass faces southwest and southeast. The larger roof overhang would shade the hot summer sun, making this vacation home more comfortable in hot weather. But the winter sun would shine at a lower angel, further under this roof, warming the glass and the house inside. 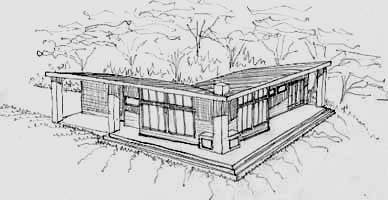 The north side would have concrete walls, allowing us to run the natural ground slope against the house on this side, protecting it from cold winter winds. A mountain vacation home needs an informal great room open to the view and the house. But it also needs private, quiet spots to escape the volume of a family reunion, something that would benefit the quiet personality of these clients. The patio includes plenty of space facing the view, and a grill for large outdoor meals. While my clients were very quiet people, they got excited when they saw these sketches. But alas, they told me they were not ready to build. I never heard from them again. Maybe one day I could see this house built.